Notes, graphs, images and key recommendations from ‘The Wambiana field day’ held on 29 August 2015. Authors: Peter O’Reagain and John Bushell, Department of Agriculture and Fisheries, 2015. 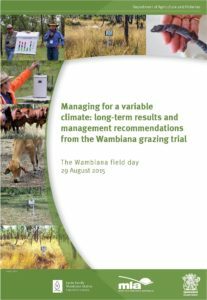 Download a copy of Managing for a variable climate: long-term results and management recommendations from the Wambiana grazing trial (PDF, 9 MB).